Gijs is a 19-year-old student from the University of Amsterdam, where he's halfway through a B.Sc. in Artificial Intelligence. 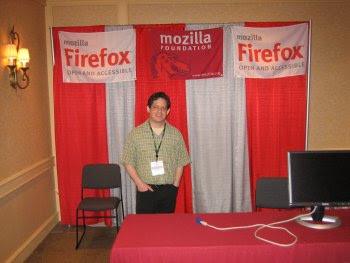 He has been involved in the Mozilla community since his first patch in November 2004. Within Mozilla, Gijs mostly works on ChatZilla (the Mozilla IRC client). Last summer, he participated as a student in Google's Summer of Code and recently he started working on a project funded by the Mozilla Foundation to make ChatZilla accessible. He drank a lot of Sprite at CSUN this year. Steve Lee is in the UK working on Jambu, a software project funded by the Mozilla Foundation. The goal is to provide first class support for users of alternative input devices such as switches. The tool will use XULRunner, a runtime for supporting XUL applications on the same platforms you find Firefox and Thunderbird. Steve, actively promotes open standards and open source with an emphasis on accessibility, assistive technology and education. Steve also keeps a blog and hacks on music. "The onchange event occurs when a control loses the input focus and its value has been modified since gaining focus. This attribute applies to the following elements: INPUT, SELECT, and TEXTAREA." Okay. Well currently Firefox doesn't follow this (at least for radio buttons), but instead does something outrageous; it fires an onchange event if something changes, for example, if the radio button checked state changes. (Although I hear it "correctly" fires onchange for a text input only when it loses focus; perhaps to avoid the event noise that would occur during text entry). Sarcasm aside, I imagine there are good reasons for the HTML Specification but I can't help but think, at least in the post submit-page-refresh model of web development, that we could stand to have a more immediate onchange event, perhaps called onvaluechange? Some hacky vanilla test code is in my exploratory. Yes, I've taken a liking to using the word exploratory as a noun. Mozilla rocked CSUN last week. In this post I hope to share a little of what I experienced at the conference. I will be blogging a little over the next few weeks about what people in the extended Mozilla accessibility community are doing. For now, I'll give a brief sampling of the event as it might relate to Mozilla. The Mozilla Foundation reserved a room for meetings, group hacking, and demos. This was a brilliant success, and the fact that this room was shared with others, such as the Linux accessibility folks, gave the CSUN community a taste of what Mozilla is all about. Tim Riley from Mozilla Corp. helped staff the booth, and in the hacking room he gave a talk about the role QA plays at MoCo. I was able to share a few meals with Tim where I learned more about the Mozilla developer culture and the way testing techniques can be integrated into that environment in a way that is both helpful to the development process, and helps build an even better product. Creators of screen readers and other assistive technology (AT) products have been working with Mozilla to enable a better user experience. If you are interested, WebAIM has a visual simulation of a screen reader. The Mozilla Foundation sent me and others from the ATRC to CSUN and I thank them for it deeply. Thank you Frank Hecker, the Foundation board, and Aaron Leventhal for getting people from all over the world together to talk about and work on freedom and choice in access to information whether it be Mozilla product compatibility, web semantics for DHTML accessibility (ARIA, microformats), or accessible choice on free operating systems such as Linux. 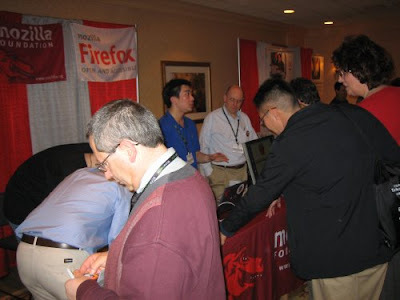 In the middle of the crowd are Charles Chen, creator of Fire Vox, and Frank Hecker from the Mozilla Foundation. Mozilla is kindly sending me to CSUN! Next week is CSUN, the "Technology & Persons with Disabilities Conference" and I look forward to mingling with the amazing community that assembles there every year. When not flitting about or helping out with the Mozilla booth I'll likely be in a room Aaron has reserved for group hacking and problem solving where I will meet with talented people some of whom I know only through IRC, email, blogs, and bugzilla. Due to scheduling conflicts I won't fly in to LA until Wednesday. I'm looking forward to the change in climate as I was out shoveling snow this morning. In related news, I think that Deb or Robert are going to pull my feed into Planet Mozilla soon so I hope to blog a bit of the CSUN experience for the enjoyment of our extended community. Jim Gettys from laptop.org emailed me the other day to offer me an OLPC X0-1 developer system so that I might work on getting on-screen keyboard support on Sugar. I think it is time to start hunting for new talent to help with this work. I started an olpc thread over on the mozilla a11y development list to see if the Jambu project might be a good option here but I'm pretty sure Steve Lee has his hands full without having to target Sugar. I think Sugar could benefit best with some customized OSK work whether use GOK, Jambu, onBoard, or something new. If you are interested in helping out contact me or Jim. Please note that "helping out" means "doing the work". "...for people without disabilities, technology makes things convenient, whereas for people with disabilities, it makes things possible." I've been blogging recently on a shared blog called dojoa11y. Today I posted a potential implementation for radio button arrow navigation which I hacked on tonight. My day was spent doing crazy things like trying to revive my GNOME svn account (I lost my private key) and struggling with an i915 video driver xorg config on Ubuntu Edgy. Ah well... now I'm going to put a dvd on... 'night. I took a few moments yesterday to revive the cron job for the accessibility planet I set up a while back. I think this might be worth polishing up and might try to get some volunteer help. Right now we house the planet at aplanet.atrc.utoronto.ca. I am sure it needs some work even to make it accessible (ahem). For instance I or someone needs to have alt text support added to the blog face/logo pics.